I believe this is only the second black and white picture I have posted to Weekly Fifty. I like to use this technique sparingly, and with a specific purpose in mind. In this case I think the lack of color hearkens back to heydays of both the paper and the building. I wanted to create a specific mood for the viewer that just didn’t quite work in color, and I hope it works. You can see the colorized version here, though it also lacks some of the other visual tweaks like radial filter adjustments and a bit of highlight/shadow adjustments too. On a bright day like this I would normally shoot at f/4 or smaller, but I wanted just a bit of DOF to show the position of the vending machine relative to the vertical support on the right-hand side. No need to use anything higher than ISO 200 either, and I am quite pleased with the end result. 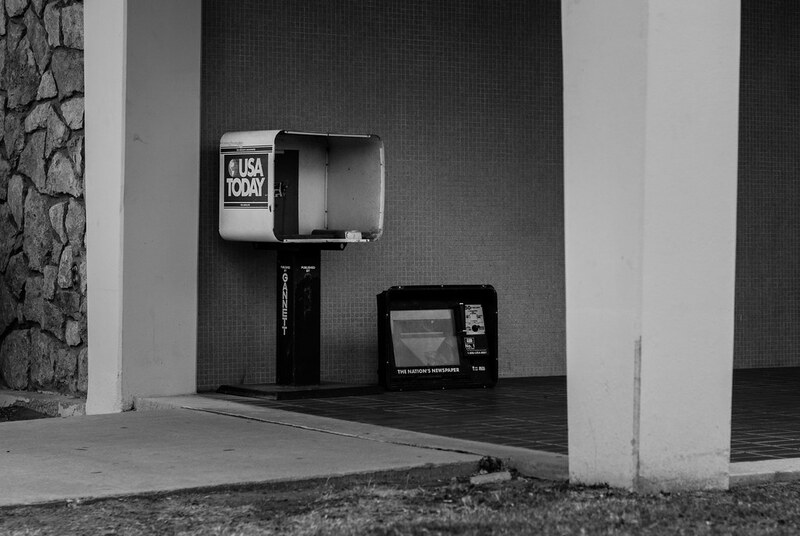 Black and white on this dilapidated News stand conveys sort of a bleak message, of things gone by, of things of the past, of the way the world turns. Sadly, time and the news wait for no one.